The Lower Rainy River/Baudette watershed lies on the United States-Canadian border, and covers 195,153 acres. The watershed is situated in the Laurentian Mixed Forest Ecological Province of Northern Minnesota. The Lower Rainy River/Baudette watershed is characterized by extensive wetlands located on the Glacial Lake Agassiz lake bed. NRCS defines MPCA’s Lower Rainy River/Baudette as two separate watersheds. Below are the “Upper” and “Lower” which combined create the full “Lower Rainy River/Baudette” Watershed as defined by this website. Intensive watershed monitoring begins in the Lower Rainy River/Baudette Watershed in 2017 and will continue through October 2018. 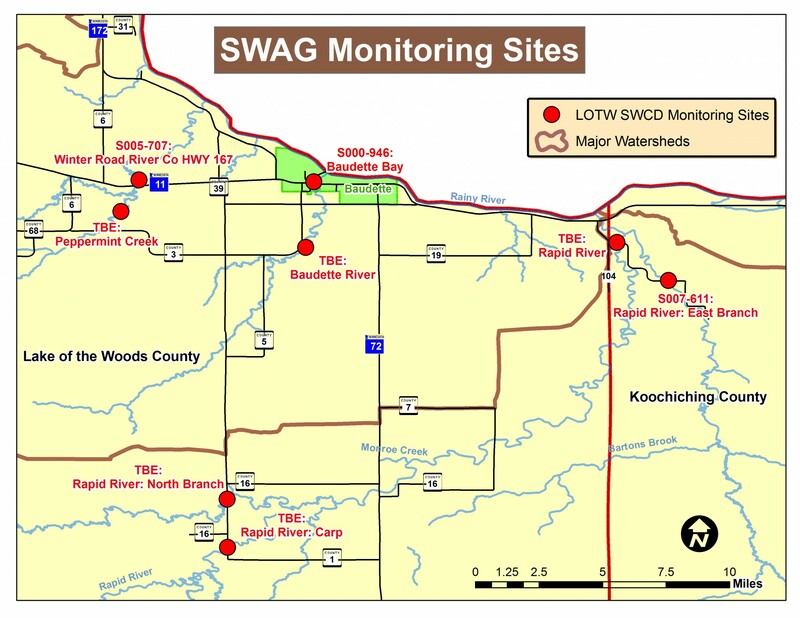 The Koochiching SWCD has partnered with MPCA and the Lake of the Woods Soil & Water Conservation District to conduct a Surface Water Assessment Grant (SWAG) over 2017-2018. The sites shown will be sampled between 2017-2018. Public Civic Engagement events are beginning spring/summer of 2017 in the Lower Rainy River/Baudette Watershed. Various types of events will be offered to allow the public as many opportunities as possible to obtain information on the WRAPS process and to provide valuable local feedback which was used in the final plans for upcoming restoration and protection. The first available Rapid River Watershed event is an open house event on May 18, 2017 in Baudette, MN regarding monitoring to be done over the 2017-2018 open water seasons. Fore more information regarding this event, please see the contact section of this page. Check back soon for future civic engagement event information!